I've created running threads documenting the cumulative benefits I have received from the Amex Platinum relative to its annual fee. The goal of this new thread is to do a similar ongoing analysis of the value I receive from the Chase Sapphire Preferred, which I just received. At the end of my first year with the C$R I plan to create a separate thread to show the relative value of the C$R and the Amex Platinum, based on my travel and spending patterns. Updates to this thread will be similar to my Platinum threads to allow ease of comparison at the end. Here's to another year of travel. Since I never fly Delta, the major difference in lounge access between the Platinum and the C$R for me will be the lack of access to the Airspace Lounge in San Diego, one of my home airports. I use this lounge ~20 times a year, and the Platinum provides a $10 food and beverage credit per visit. I can still get into the lounge because it doubles as an Admirals Club (for which I use the Citi AA Executive to access), but I will be losing the $10 credit per visit. Also, since the Centurion Lounge is an Amex product I will lose that also, however I was only able to make four visits with my Platinum last year, and the food was horrible last time I was there. This isn't a big loss for me. I'll just use the nearest Admirals Club, which is more convenient 90% of the time anyway. The C$R was just delivered to me this week, so I haven't gotten my Priority Pass package yet. Like most of my trips I wouldn't have gotten any value out of it today anyway. I am going to make an attempt to do a better job of listing the potential Priority Pass options than in the past by including a cumulative footnote in these posts, but at some point this size of each post will become unmanageable and I will need to find a better way to do this. Note that Priority Pass is adding options (bill credits at certain airport restaurants/bars, and access to Minutes Suites), so I hope to get more value in 2018 than I have in the past. The most important (and personally subjective) variable is the value you place on UR points versus MR points, if you're comparing Amex Plat with C$R, and as a savvy CBer, of course you have to. I don't think 1 UR = 1 MR, but it depends so much on your redemptions. What are you going to use these UR points for? Definitely subscribed. Especially since I almost always fly Delta. 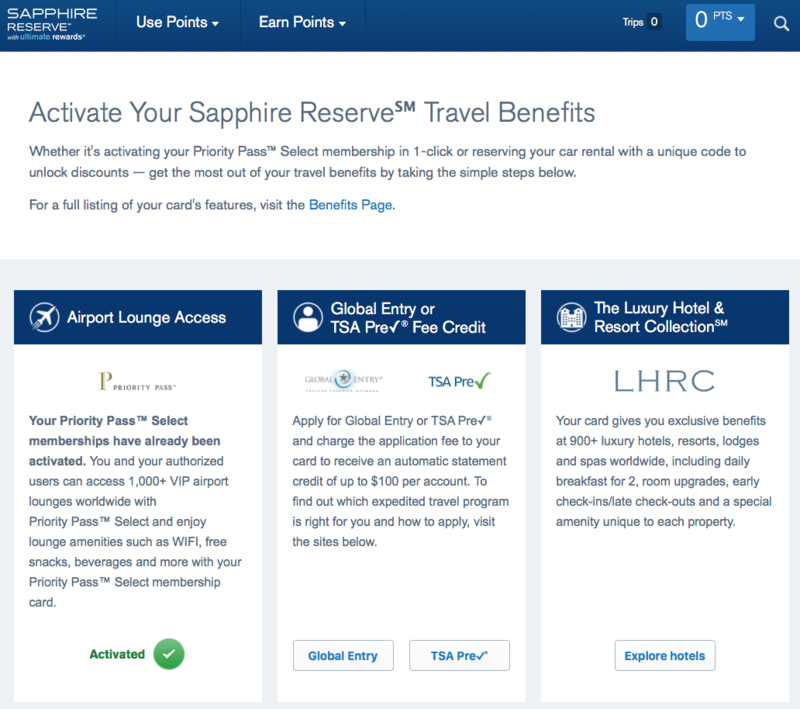 As far as the Priority Pass, you can get to the website through the Chase portal and then sign up for the digital membership card (install the app, login and then you're good to go). I want to say I had to setup the membership and didn't just receive a PP card in the mail, but I could be wrong from 2016 memories. I'm personally looking forward to using the Minute Suites at least once in 2018. I don't have a specific intended purpose for the URs just yet. If this year is like the past two, I will end up using the URs at $0.015 cpp on revenue tickets on AA. This would be a poor value for a lot of people, but my Executive Platinum status is the most valuable travel perk I have, and I've needed some extra EQMs from flown miles each of the last two years to requalify. I would rather contribute to another year of free flight upgrades (75% of miles flown in 2017) than have a couple of free nights in a suite at a Hyatt somewhere, or fly business class to the Isle of Ball Stickage on an award ticket. I knew I wasn't going to have any use for Priority Pass today, so I didn't bother even checking for options (plus I still have an active PP membership with my Platinum). Thanks for the tip about signing up online, though. I'll give that a try. My next trip in the next week or two (not yet booked) will be back to Mudland, where the PP welcome kit will probably be mailed. Safe travels to you as well. Considering saver award availability, 1.5 cpp is a great option on American. I used that a lot in 2017. I only use my UR cards in 5x and 3x categories so that is still 7.5% and 4.5% per $1 spent. I also won't be putting any 1x spending on this card except to hit the minimum spend for the SUB. In fact, after I get the SUB, it's back to the Aviator Silver EQM/EQD treadmill until I hit $50,000 in spending on that card this year. This is basically a sock drawer card for much of the year, just like my Platinum was. I used the Platinum for little more than airfare purchases, and then only in the last half of the year. Priority Pass can be activated at chase.com/reserve. The card comes in the mail, presumably with instructions on how to activate the digital membership card. You just need to download the app on your phone and create an online account. Thats the digital card. I already have the app and an account with my Platinum. I guess I could create a second account. How do you identify yourself to PP? Do they validate your Chase card number? I cant remember what I did to be honest. I imagine you will need a different login. When I signed up for a PP account with my Platinum card I believe I needed the PP membership number, which arrived in the mail with the physical card. I know I needed that, but dont remember if they also asked for CC information. I dont think they did. CV thank you for your Amex report, and i'll be following this to see how it works out for you. I myself am a major UR hoe, and as much as I would like MR to work for me they don't. Wishing all a great 2018. I think you're right about signing up for the digital PP in that they require your PP account (card) number. It didn't require any Chase numbers or external verification. But since you 'enabled' the PP from the benefits page, the card should arrive for you any day now. I ended up having to do this for the second year of the C$R because I never received, or I misplaced, the renewal card. Considering my lounge usage has been extremely low, I'm okay not hauling around an extra card in my wallet all the time. Pleased that you're finding the info useful. Happy travels. I wonder where the card will end up. I used the Mud Hut on the application but specified our California address for card delivery... and then after approval when I found out it was being sent overnight I had the card delivered to my hotel in New Orleans. I'm betting the delivery ends up in California. I will be here for another week or two, and I will post an update when the card arrives. Wherever it lands. So PP has your billing address on sign up. That makes sense. On a related note, I finally found my physical year-two PP card sitting in a pile of mail that was forgotten during my year-end travels. With the option of yet another card in the wallet, do you see yourself possibly using the phone app more often? I haven't used it yet, but freeing up room in the wallet doesn't seem like a bad idea. Unless there could be some downsides to not having the physical card...say overseas? Perhaps I'll carry the card for a bit this year as a backup and see if it will be truly useful. If nothing else, the app helps to identify the lounges and their locations. My methodology for tracking the value of Priority Pass is evolving, because to me what's relevant is not just the value of the Priority Pass visits themselves, but also the relative value of the lounge access benefits on other cards. The goal of this thread hasn't changed, but I'm expanding how I'm tracking the value of the C$R Priority Pass benefit by comparing it to same-trip travel options that I have with the American Express Platinum Global Lounge Collection, and the Admirals Club membership we have with the Citi AA Executive. I am going use calendar year 2018 as the reference due to overlapping membership periods on each of the card. My laptop bag goes with me every time I travel. Inside one of the pockets is some currency wrapped around a stack of cards that I generally only use when I travel, including two debit cards, my Chase Marriott, the (soon-to-be-downgraded) Platinum for the rare occasion I can use a Centurion Lounge, the US Bank Cash+ (5% back on rental cars), the Citi AA Exec (Admirals Club access), and the Priority Pass card. I have the app now, and it's annoying because it's constantly wanting to download lounge updates, and won't let you use it until you do. It's easier for me just to check prioritypass.com for lounges along my route and then use the physical card on those occasions where the opportunity presents itself. It didn't take long to use up the 2018 travel credit (intended for household use, since household funds will be used to pay the annual fee), but unfortunately the credit was automatically split across all or part of three purchases that were made for three entirely different purposes. Uber ride to the San Diego airport on my way to Mudland last week. This is a household expense that would normally be paid from our joint Bank of America account. One-way airfare for my dad to go their summer house in May. This would normally be paid from my personal Wells Fargo account until my parents and I settle up at the end of the month (I purchase things for them throughout the month). Part of a one-way ticket (until the $300 was exhausted) for me to attend a meeting in Southern California in a couple of weeks. This would normally be paid from my Barclays savings account until reimbursed by my employer. It's not a tremendous amount of extra work to track these differently than I normally do and make a couple of transfers (and it's only $300 total), but I wish I had thought ahead and put purchases 2 and 3 on other cards, or just put all $300 into AA gift cards for household use later. Lesson learned for the 2019 travel credit.